Home » WannaBeDebtFree » How To Save Money on Clothes Forever…And Make Money in the Process! Back when I was in £16,000 of personal debt, I was a closeted shopping addict who loved to spend away the blues. My wardrobe was stuffed with clothes, bags and shoes, yet I felt like I wore the same few items on rotation, and I hated getting dressed in the mornings because piecing together an outfit from my homage-to-Narnia wardrobe was overwhelming and stressful. A lot of my impulse buys went on credit cards, yet there was about £2,000 worth of clothing in my wardrobe that I barely wore. One day, I decided to clear everything out to simplify my life, and I haven’t looked back. The truth is, when I bought clothes, I thought I was saving so much money! I used discount codes, I shopped the sales. But a saving is only truly a saving if you would have bought it at full price, whereas my spending was dictated by discounts, and in reality, I wasn’t saving- I was overspending. To make matters worse, I was buying the same types of clothing I already owned, pieces that I wasn’t going to get enough wear out of to justify the cost, and things that I thought looked prettier on the self than they did on me. My strategy was all wrong, and hideously expensive. I think this is a pretty relatable tale; many of us have over-stuffed wardrobes with a credit card balance to match, and yet we think we have nothing to wear. But in fact, not only do we have more than enough clothes, but the sheer volume of clothes we own makes it really hard to optimise our wardrobe. 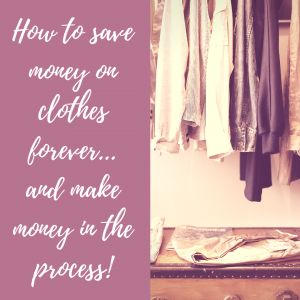 Wouldn’t it be great to simplify your clothing, make some money on the things you don’t wear, and cut down on your future clothing costs for good? Getting into the habit of saving money on clothing usually starts with having a good declutter. Decluttering allows you to take stock of what you already have, what we might need in the future, and get rid of the things you don’t wear. The easiest way to clear your wardrobe is to take some time and separate your clothes into three piles; keep, sell and donate/throw away. Your keep pile will be the things you absolutely love and will continue to wear, your sell pile is for the things that you won’t wear and are of decent enough quality that you can re-sell and any duplicates of your keep pile (let’s be realistic, how many plain black tops do you actually need? ), and your donate/throw away pile are the items you can’t re-sell. Re-selling your clothes is one of the fastest ways to earn some extra cash. Selling through eBay, Shpock, Depop or Facebook Marketplace, you can find a forever home for your old clothes and make a profit in the process. It might take you a few hours to list everything but many people have turned reselling into a part time hobby or a full-time profitable career. It’s certainly worth the time and effort and you’ll feel better knowing that you recouped some of the cost of that £40 jumper you only wore a few times (we’ve all been there!). A downsized wardrobe can be an oasis of tranquility. When you downsize, take some time to KonMari your drawers. Marie Kondo’s method for storing clothing allows you to see everything in your drawers, not merely the top few items. This means you aren’t automatically reaching for the top items, wearing a few things in rotation and perceiving that you have a lot less than you actually do. It’s well worth the laborious- but oddly therapeutic- task of reorganising your things. KonMari’ing helps to build an awareness of your existing wardrobe because you can see it all in front of you, so duplicate purchases, like those jeans you keep re-buying, can be avoided. It enables you to purchase more mindfully. Is this an impulse buy, or have I planned to buy it? Will I wear it enough to justify the cost? Does this purchase fit with some of my existing items, or do I need to buy items to wear it with? The Minimalists, the authors of How To Live A Meaningful Life (one of my absolute must-reads for anyone looking to cut their spending by changing their mindset), which documents their journey from six-figure corporate jobs to living a life with intent. On their podcast, they explore a lot of ideas on how ‘stuff’ keeps us tethered to commitments, jobs and responsibility we don’t want, and it’s a great resource for anyone who wants to get out of debt by changing their spendy ways. When it comes to seeing something we love while shopping, we are hardwired to want to possess the thing as soon as we see it. But we don’t have to buy it, we can simply appreciate how beautiful the thing is, and move on. Do this, and you will save a fortune on all of those things you would have otherwise bought and barely worn. When it comes to clothes, quality is always better than quantity. We cherish the items that we’ve saved for, we look after them, we feel like our best selves in them. We deserve quality. With better quality, you tend to get a lot more wear for your money. And you are more likely to get them mended or altered when you’ve invested in an item. In the long run, you’ll save a lot of money by dry-cleaning your quality Winter coat, rather than purchasing a new, cheaper one every year. So instead of shelling out for a few bits that won’t last as long as their next wash, save your money. Buying better quality is always the ideal, but what if your budget is more Primark than Prada? Buy second hand. Start with eBay, which is a treasure trove of barely worn, if ever, clothes that you can save a fortune on the RRP. Factor in the cost of a dry clean if it would make all the difference to you in converting to second hand when you’ve previously only worn new, and be open-minded about the process. Most of us have no problem borrowing an item from someone, and this isn’t really much different, with the added bonus of living more sustainably, too. Even the fashion industry is encouraging us to re-wear our quality investments pieces. You can check out Jess Cartner-Morley’s (associate fashion editor for the Guardian) series on sustainable fashion here. The times, they are a-changing, and it’s about time. Building a capsule wardrobe to simplify and live your best fashionable life is fast becoming a trend. Courtney Carver of Project 333 describes a capsule wardrobe as, ‘A small collection of 33 items including clothing, jewelry, accessories and shoes that encourage you to wear your favorite things every day (not the trendiest things, the most stylish things, or the perfect things … your favorite things).’ You can read more about it over on her blog, Be More With Less. Imagine the freedom of knowing that you have only a few items to choose from, and you don’t need to buy anything else to complete your wardrobe? That’s the dream. I was so the same as you with binge spending on clothes and thinking I was saving money with sales etc! Whereas now I think I’ve had 2 clothes spending sprees this year and found that I was much more selective about what I would buy! It really is a shift in mindset you have to go through I think, I don’t miss buying clothes now, but I appreciate the items I do buy a lot more. Great post!